This post will be a quick overview of the Taylor 400 series acoustic guitars. 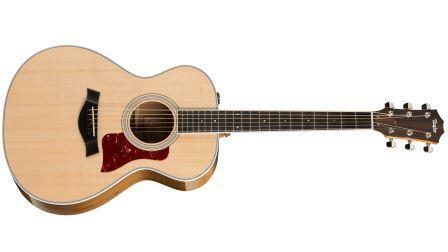 It will outline the similarities and differences between the different guitars in the series. O.k so that seems like a lot to look at. But there are a lot of similarities and only subtle differences between the different models. Before looking at the individual models, let’s make this list easier to look at if you’re not sure what all these numbers and letters mean. The 2nd number signifies the type of the guitar. “1” is for six string and “5” for 12 string. The 3rd number signifies the shape of the guitar. “0” stands for Dreadnought. “2” stands for Grand Concert. “4” stands for Grand Auditorium. “6” stands for Grand Symphony and “8” stands for Grand Orchestra. If there is a capital “R” at the end of the name this signifies that the guitar has Rosewood back and sides. O.k. let’s get into each guitar and see what the similarities and differences are. Starting with the most basic dreadnought model, we have the 410e. 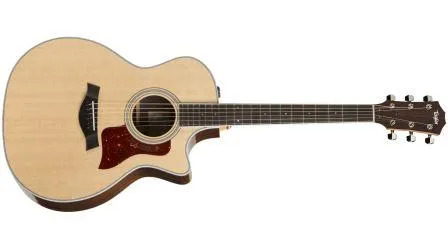 The unique feature of this and most of the other guitars in this series, when compared to other Tayor guitars, are the Ovangkol back and sides. Ovangkol is a rosewood-esque tonewood. It’s not exactly the same of course but it’s easiest to describe by saying that it’s close to rosewood. The major differences in this tonewood compared with rosewood (according to Taylor) is that Ovangkol offers a slightly fuller mid range and brighter treble response more similar to Koa. Literally the only difference between the 410ce and the 410e is that the 410ce has a venetian cutaway – whereas the 410e has no cutaway. That also adds to the price but otherwise the cutaway is the only difference. The biggest difference with this model compared to the 410e is that it has Rosewood back and sides in place of the Ovangkol. Which back and sides is better? In my opinion neither is better – it comes down to personal preference. What do you like the sound of better. The other difference is that it has an 1 11/16” (43mm) nut width – so a narrower neck width. The 410-R also doesn’t have a cutaway or electronics which brings the price down a bit. This is the 410-R except with electronics included. Or said another way it’s the 410e with Rosewood back and sides and a 1 11/16” (43mm) nut width. This is the 410-R except with electronics and a cutaway. Or said another way it’s the 410ce with Rosewood back and sides and a 1 11/16” (43mm) nut width. The major difference between the 412e and the 410e is the Grand Concert size/shape. This is quite a significant difference though. The smaller Grand Concert body size is more suited to fingerstyle and responds better to a lighter touch than the larger Dreadnought body which is more suited to strumming and flat-picking. The smaller Grand Concert also has a lower volume ceiling – so if you strum it quite hard your volume will be limited and you’ll be able to distort the top more easily. The other major difference is that it has a shorter scale length – 24 7/8” (631mm) compared with the dreadnought model’s 25 1/2” (648mm) scale length. All other details are the same as the 410e. As you would expect, this is exactly the same as the 412e except that it has a cutaway. The same as the 412e except that it has Indian Rosewood back and sides in place of the Ovangkol. The 412e-R with a cutaway. Or said another way – the 412ce with Indian Rosewood back and sides. You can probably sense a pattern by now. The 414e is the same as the 410e and 412e except that it has a Grand Auditorium shape. This shape is more similar to the Grand Concert in that it has more defined waist – but the size is closer to that of a dreadnought. It has an overall smaller top than the dreadnought because of that more defined waist – but it has the same body length, body depth and lower bout width as the dreadnought. This shape is a great balance for those who like to strum, flat-pick and play finger-style. 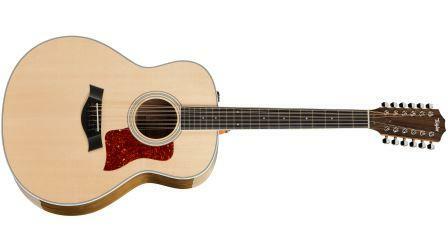 It has a higher volume ceiling than the Grand Concert but responds better to a lighter touch than the dreadnought. The 414e has the same scale length as the 410e – 25 ½” (648mm). 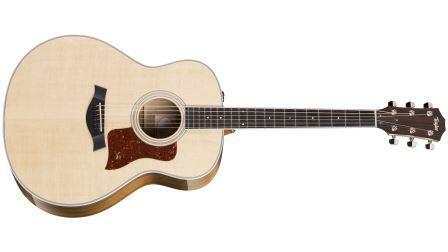 The 414ce is the same as the 414e except that it has a cutaway. The 414e-R is the same as the 414e except that it has Rosewood back and sides in place of the Ovangkol. The 414ce-R is the 414e-R with a cutaway. The major difference for the 416e is that it has the Grand Symphony shape. This shape is a large body with a big voice. It has a lower bout larger than the dreadnought and a less defined waist than the Grand Auditorium – but still a more defined waist than the Dreadnought. Taylor describe it as a Grand Auditorium turbo-boosted and has piano-like bass, a strong mid range and thick trebles. It is described as being full, loud and with heaps of sustain and is great as a strummer but also has the ability to respond to a light touch. The 418e is the Grand Orchestra Model. This shape is like the Grand Symphony, only bigger. So you get a big bold sound that is full and loud and meaty and thick and has a high volume ceiling – but it also responds to a light touch like you would expect from a smaller bodied guitar like the Grand Concert. That makes this body shape very versatile. This is the largest body shape that Taylor has. 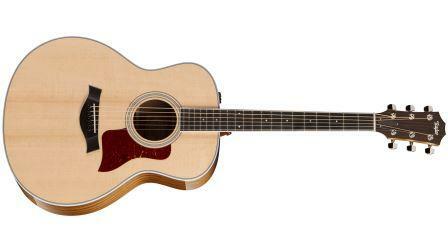 This shape, as well as the Grand Symphony, is often used for Taylor’s 12 string guitars (see below). This is the Rosewood back and sides version of the 418e. Now we’re into the 12 string models, the first of which being the 456ce. The 456 uses Taylor’s Grand Symphony shape. 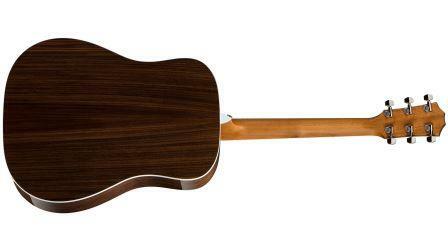 This is the Rosewood back and sides version of the 456ce. The 458e is the 12-string version of the 418e. It is in the Grand Orchestra shape. 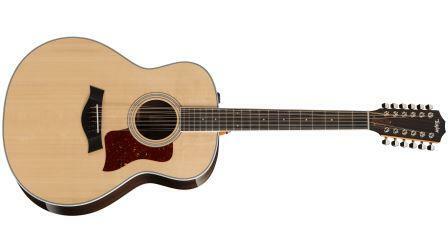 Like the 456ce it has Taylor’s 12 string bracing and a 1 7/8” (47.5mm) nut width – necessary to house the extra strings. The 458e-R is the Rosewood back and sides version of the 458e. 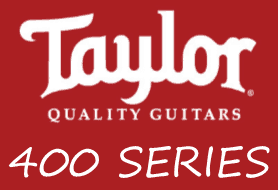 I hope this post has helped you to understand the differences between the models in Taylor’s 400 Series of acoustic guitars. Which one suits you best will depend on a number of things including your genre preferences, tonal preferences and your unique playing style among other things.